Planting marigolds – as well as fruits and vegetables – at Elsipogtog First Nation. If you’re a student or teacher at Eel Ground, Elsipogtog or Toronto First Nations schools, or a participant in Atelier 850’s after-school program in Montreal, it grows GREAT! With the support of Nutrients for Life Foundation (NFL), CFTC is growing our school garden program as an element of our work supporting better nutrition to children in high-risk communities across Canada. School gardens are a great way to reinforce lessons on healthy eating while making healthy food more accessible to these communities. 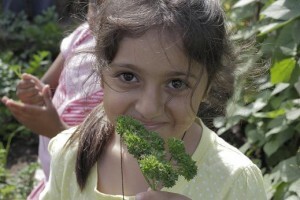 School gardens have been identified as important components of food security and nutrition by leading experts worldwide, including UN Special Rapporteur on the Right to Food, Olivier de Schutter. 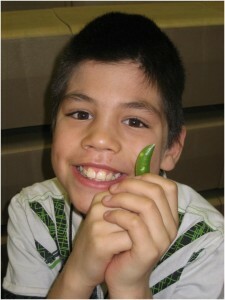 In his March 2013 Report, de Schutter specifically recommends that school feeding, food literacy, and school garden programs be funded as community-based strategies to combat hunger and food insecurity in Canada – which is high, and on the rise, especially in Canada’s most vulnerable Aboriginal communities. 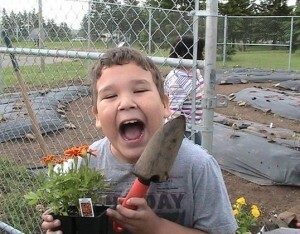 An Elsipogtog student shows off the fruit – err, pea – of his labour! inspiring a sense of community belonging and pride. Developing healthy eating habits at an early age has positive lifelong effects on physical health and improves students’ confidence to become active members of their communities and responsible stewards of their environment. The school gardens programs are integrated into the curriculum and include a strong Aboriginal history and culture perspective. Patricia Murphy, a registered dietitan at Elsipogtog First Nation, has seen concrete evidence that the benefits of school gardens are extending to the broader community. 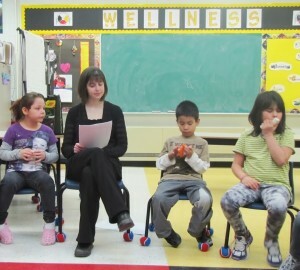 “Students are sharing with their parents and caregivers the healthy eating messages they are receiving at school and asking them to purchase some of the healthy foods they are having there. They are also educating their parents on disease prevention. For example, during a nutrition counselling session for diabetes, one parent told me they had learned some of the recommendations and healthy living practices from their child who had participated in a diabetes education session at the school,” reported Patricia. Inner-city children in Montreal – as in other locations – discover new foods. Elise Twyford, literacy/numeracy teacher at First Nations School of Toronto, has also seen the impact of school gardens firsthand. At a recent conference bringing together agencies and key stakeholders who work in Aboriginal nutrition to plan the next step in CFTC’s Canadian program, Elise described a memorable moment working with a student in the garden. “She had never even SEEN parsley before, much less eaten it!” said Elise. Some of the foods that children have grown include carrots, radish, tomatoes, potatoes, broccoli, cabbage, peppers, onions, beets, strawberries, watermelon, cucumber, sage, rosemary, basil, celery and cilantro. Many of these are simply not staples on their dinner tables at home – as Elise and others involved in the gardens program have noticed. Children are being exposed to foods that they might never have tried before, and being able to taste and enjoy foods that they’ve worked so hard to grow makes the experience even more rewarding. Whether it’s parsley or potatoes; cabbage or cucumber – the importance and value of the gardens to First Nations children is far-reaching. Food security and nutrition in First Nations communities is intricately tied to Aboriginal history, culture and relationship to the land, and so the school garden is integrated into the curriculum alongside that tradition. 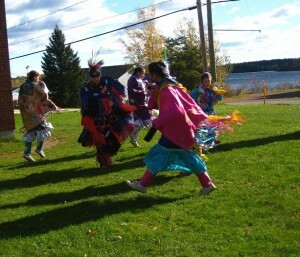 The Fall Feast at Elsipogtog – celebrating good food, culture and community. “Children have learned precious traditional knowledge from the community Elders, including the story of the Three Sisters (corn, beans and squash) which are grown in our garden,” adds Patricia. The Elsipogtog garden is built in the form of a medicine wheel to reinforce the traditional Mi’kmaq teachings around the passage of the sun and the seasons. On Aboriginal Day, June 21, the garden will be blessed by Elders who – along with Elsipogtog’s alternative school and summer program team, children, youth and parents – tend it during the summer months. Patricia explains how the entire community is involved in the garden: “Teachers, school staff and students are involved in the planting and tending of the garden in the early phases. In the fall, a number of people are involved in the harvesting, preservation and preparation of the food and help organize the community feast.” The fall feast is a time for students to show off their hard work and resulting bounty. Students prepare food and serve the Elders and other community members the fruits – literally – of their labour, a task they take quite seriously and carry out with much pride. Breaking ground at Eel Ground! Karen Sobey, community health nurse and project coordinator for Eel Ground (centre) with Genevieve Drouin, CFTC’s Regional Program Manager – Americas (left) and Mueni Udeozor, Program Officer (right). Mueni Udeozor, CFTC’s Program Officer, and Genevieve Drouin, Regional Program Manager – Americas recently visited Elsipogtog, Eel Ground and Tobique First Nation and found the state of the school nutrition programs and gardening projects impressive. “In a population and communities with higher-than-average obesity and diabetes rates, the school gardens can have a great impact with the right investment and management,” said Genevieve. The additional funds that CFTC has committed this year will allow each program to expand, and Elsipogtog – which has the most experience – will start a composting program that will help nourish their well-established garden. At Eel Ground, the school garden is a vital ingredient in the “Healthy Bodies, Healthy Minds, Healthy Spirits” program that unites a multi-initiative health and wellness program around a common and culturally-meaningful theme. 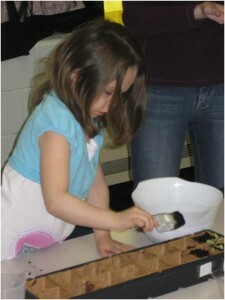 Children plant and nurse their seedlings indoors, then later replant it outside and watch it grow. Support for the Eel Ground school garden has been outstanding: so much so that they’ve had to scale back their plans to something a little more manageable. This year, children and school staff have cultivated a one-acre plot. Each child has been nurturing their own seedling in the classroom, and in the past month or so, each class has taken a turn planting them in the garden. Produce from the gardens is intended to eventually supplement the school breakfast and lunch programs that are part of CFTC’s core program in each of these communities. In Elsipogtog, there is already enough produce generated from the garden to distribute to high-risk families in the community.